G. Schull, C. Arrigoni, I. Arfaoui, A. Huard, L. Douillard, C. Fiorini-Debuisschert and F. Charra. Molecular formulas (upper) arrangement schemes (middle) and STM images at liquid-solution interface(lower) for the mono- bi- and tri-functional building blocks (left to right). For bi-functional molecules, both rectilinear and hexamer structures are represented. The core molecule was hexabenzocoronene (HBC). Width of STM images: 7.8nm, 8.1nm, 17.0 and 8.9nm (left to right). Current imaging mode at a setpoint of ~10pA and a bias of 1.0V. The spontaneous ordering and assembly of molecules on well-defined surfaces constitutes a promising bottom-up route in our quest for atomically-precise fabrication of functional molecular architectures. We have developed an original approach to the design of self-assembling building blocks tailored so as to form on demand specific hierarchical topographies. 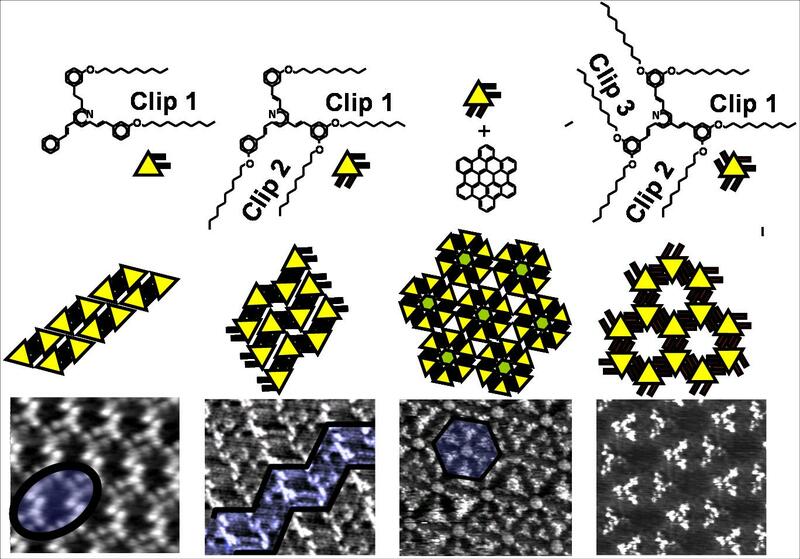 Based on our long-term experience on self-assembly of triphenylene-cored columnar liquid crystals , we conducted a systematic analysis of the important role played by substrate interactions . This led us to a generalization of the 2D molecular sieves . We designed a new molecular unit acting as a functional linking group able to form strong surface-assisted intermolecular “clips”. These non-covalent bondings are based on an interdigitation of alkyl side-chains which strictly mimics alkane epitaxial assembly on HOPG. We have thus realized various target topologies: mono- bi- and tri-functional molecules building blocks forming dimers, chains or 2D networks respectively, each entity further assembling in the most compact structure. We have also exploited the dynamic constitutional diversity of such systems for the realization of higher-order nested super structures at unprecedented scales. For example, the addition of a hexagonal well-fitted core molecule to the linear chains of bi-functional building blocks induces their reorganization as cyclic hexamers, them organized on a higher scale in an unprecedented overall periodicity of relative to HOPG.